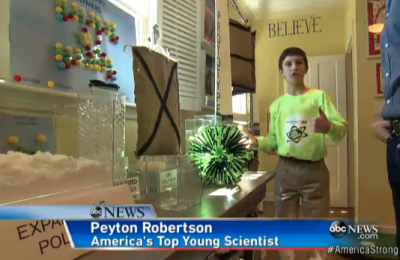 Fort Lauderdale, Florida sixth grader Peyton Robertson may revolutionize how we protect ourselves and property from flooding. Earlier this month, he won the Discovery Education 3M Young Scientist Challenge for his sandless sandbag. The Young Scientist Challenge is sponsored by 3M and the Discovery Channel Education and is open to students in grades 5 – 8. The 2014 challenge opens in late December. Student scientists can win cash prizes and trips. Robertson, who wants to be an inventor when he grows up, has invented a sandbag that doesn’t use sand to stop flooding. His bag is “sandless” and contains a much lighter polymer. Sandbags weigh about 40 pounds each, but the sandless sandbag only weighs only a few pounds. 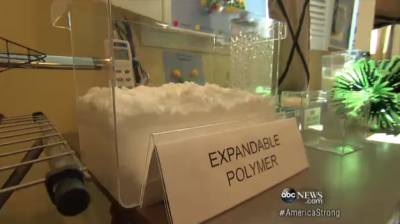 The sandless bag is filled with a mixture of an “ultra-fluid” polymer and salt. When the bag gets wet, the polymer absorbs water and expands, keeping water from seeping through the cracks between bags. This bag is heavy when expanded and won’t float away either. 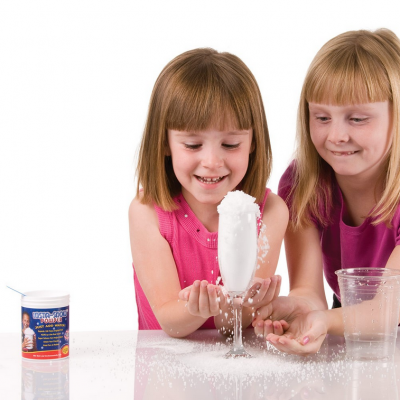 The polymer looks very similar to our Water Gel or Insta-Snow, or the polymer found in a baby diaper. 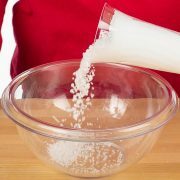 Insta-Snow starts out as a fine white powder, but when water is added, the powder absorbs it and quickly expands. Robertson says he came up with the idea after he and his family hid in a closet during Hurricane Wilma in 2005. It was the third hurricane in the 2005 season to reach Category 5 status. Wilma was also the most intense tropical cyclone ever recorded in the Atlantic and was responsible for 62 deaths. His neighborhood was devastated by the damage, so Robertson set off to find a way to keep the water out.